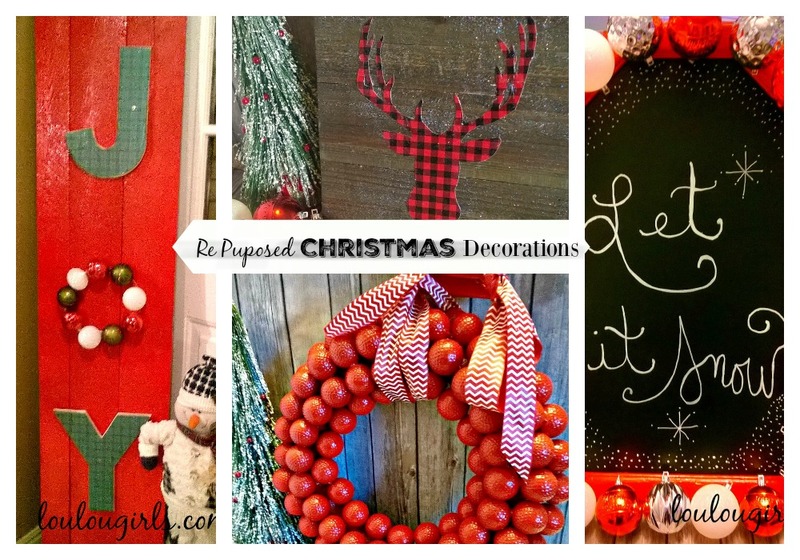 Lou Lou Girls > craft > Re purposed Christmas Decorations! Last year, after Christmas, me and my husband decided that we were going to throw away some of our old Christmas decorations because some of them have been around for a long, long time. Well, when we went to get out our the Christmas things this year, we found that we had gotten a little crazy and thrown more than half of them away! This wouldn’t be a problem if I would have went to the clearance sales after Christmas or if I had so much money that it just didn’t matter but that is not the case! I was a little frantic because I love Christmas and love to decorate for this holiday and when I went to the store to replenish my decoration supplies, I just didn’t find things that I loved. So needless to say, I got a little creative and re purposed things that I already had and I love how they turned out! Reindeer are so popular right now! I have been so excited to incorporate it into our Christmas! 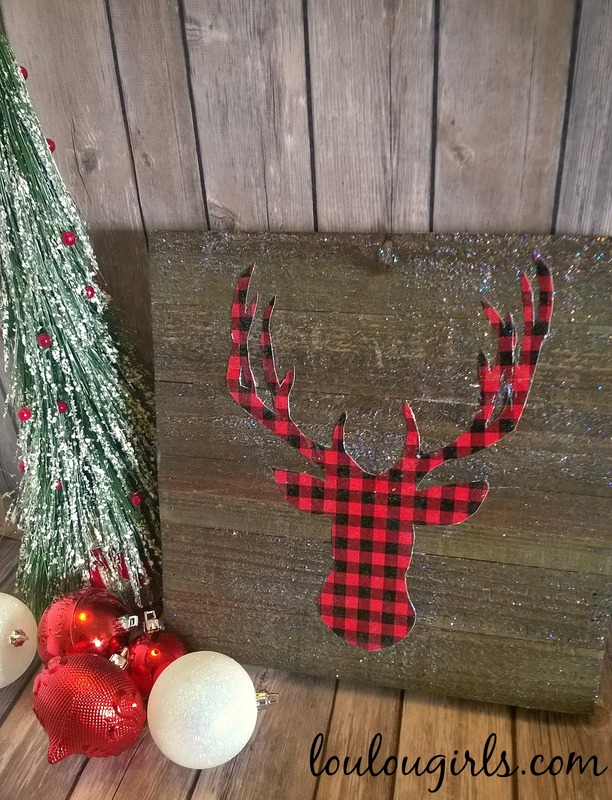 I did buy the wood piece from Walmart for under $10 but I went to Google Image and found a reindeer pattern and print it out. I used a plaid gift bag for the deer head. Make sure to get a craft knife to cut it out, it makes it so much easier! Modge Podge that bad boy to the board and it’s done! Do you remember my golf ball wreath? If you missed it, click on golf ball to check it out! I took my blue golf ball wreath and sprayed that puppy with the red spray paint and fell in love again! 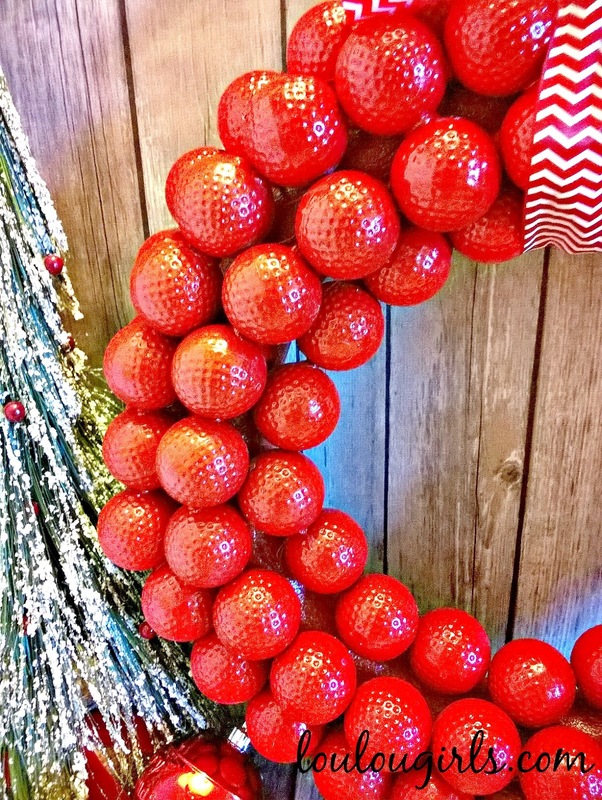 Making the golf ball wreath is so much cheaper than most of the wreaths that they are selling in the stores. 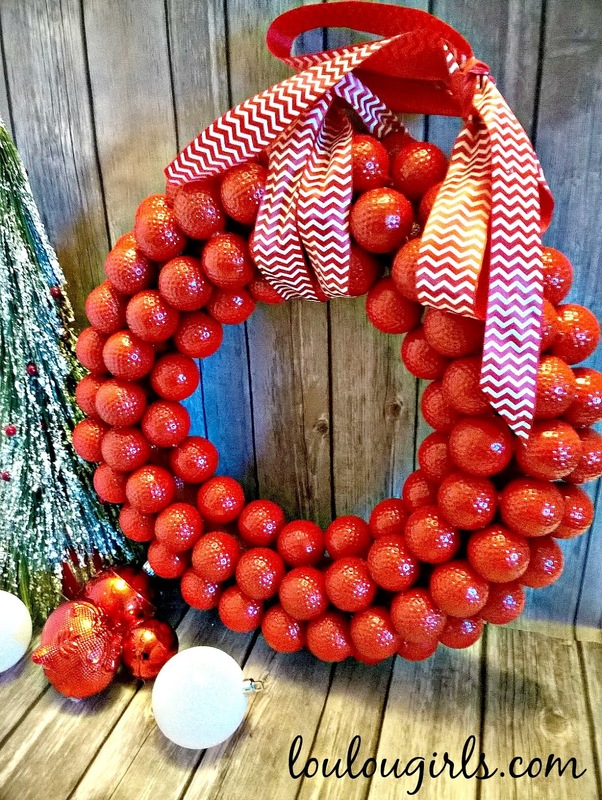 The golf balls are plastic practice balls and a bag of 6 balls are under $2, and your wreath will look so much better than the ones for $40! I had this mirror that had fallen behind my chest of drawers and been there for a while. It was broken and covered in dust, and usually it would of been thrown away long ago. 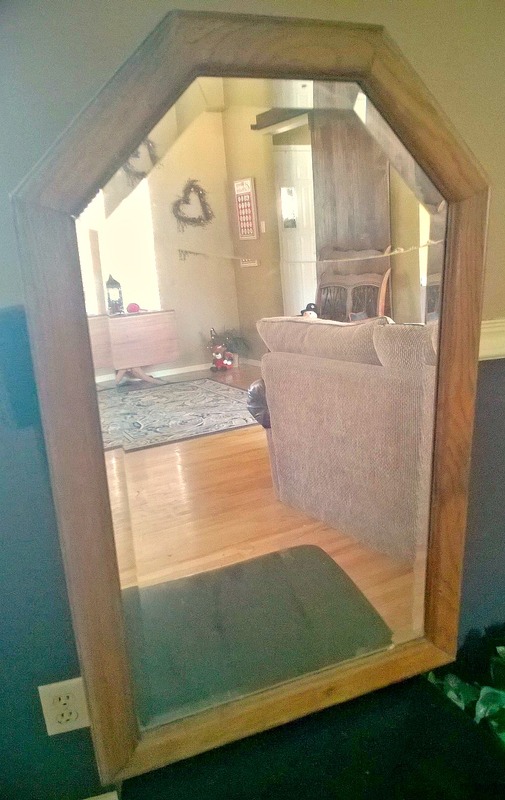 I took off the back of the mirror and removed the glass. 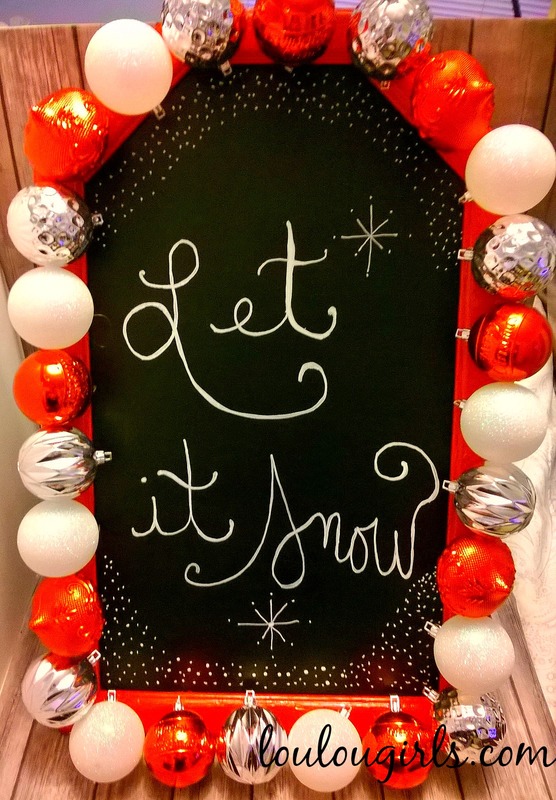 The backing of the frame was cardboard and I painted it with chalkboard paint. The frame, I painted with the red spray paint, I love spray paint, and let everything completely dry. I took my chalkboard marker and wrote on the chalkboard and let dry. With my trusty glue gun, I glued on ornaments onto the frame. Put it together and you have a show stopper! I love the board signs! I had one that I had used for our Thanksgiving decor. I took everything off of it and repainted the board with red paint. I found letters at JoAnn’s and Modge Podge scrapbook paper onto to the letters. I have tried to glue these letters onto my board before but they always fall off, so we put one screw into each letter to secure it. For the “o” we used a bowl to make a pattern to follow and then hot glued the ornaments around the pattern. I would love to have this on my porch but I found out last year that ornaments hot glued to something doesn’t work out with Utah winters! If you are like me, and need a little help with decorating this year, I hope this helped! Love the wreath. Super cute ideas! Lots of great ideas, but I gotta say I just love that golf ball wreath! Thanks for sharing on the #HomeMattersParty . I hope you will join us again next week. I've always loved your golf ball wreath, and I think I like this as much as the original, I can't choose which one I prefer! LOL And I really love the deer head on the reclaimed wood, so on trend!!! Have a great holiday season! Fabulous ideas and featuring you when my link party opens up tonight! What great decorations you created, I have to admit that the golf ball wreath is a keeper.